American company Netflix announced that it has acquired rights to be the exclusive streaming distributor of Egyptian documentary The Square starting early next year. The company billed The Square as its first major documentary acquisition since its announcement last month that it wanted to make more direct investments in the movie business. The film, which has been called a serious Oscar contender by many publications worldwide, is currently getting a limited run in movie theatres in New York and Los Angeles in order to qualify for the Oscars, for which the nominations will be announced in January 2014. By acquiring rights to The Square and making it available in the first quarter of next year, Netflix will be able to promote the film’s availability during Oscar season. The Square, whose Egyptian-American director Jehane Noujaim was arrested three times while filming over the course of two and a half years in Cairo, has so far received extremely positive reviews, with a rare 100 percent rating on popular film website RottenTomatoes.com. It has already won audience awards at the Sundance Film Festival and the Toronto International Film Festival. The Square is a story of revolution in Egypt, from the 2011 overthrow of 30-year autocrat leader Hosni Mubarak, through military rule, and culminating in the ouster of Islamist president Mohamed Morsi by the military in July 2013 following mass nationwide protests against his year in power. 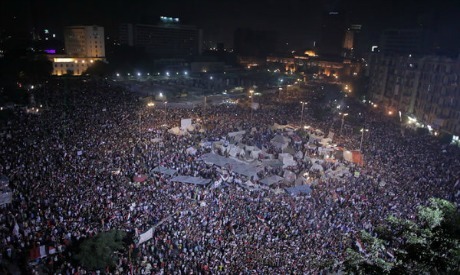 The film's website (thesquarefilm.com) says it is "the story of revolution behind the headlines," following a group of Egyptian activists "as they battle leaders and regimes, and risk their lives to build a new society of conscience." Competition in the documentary category at the Oscars is often very high. Other films generating early Oscar speculation include Blackfish, about orca whales at theme parks, and The Act of Killing, focused on Indonesian genocide.